Adriana Muntean is a certified neonatal intensive care registered nurse. She enjoys writing professional articles and power-point presentations on health care issues. Her writing has appeared in the Neonatal Newsletter. Muntean is currently working towards her master's degree in nursing at Stony Brook University. Magnesium stearate is a compound formed from the incorporation of stearic acid with a magnesium ion. What results is a compound that has lubricative properties. These properties are added to a variety of supplements in order to keep vitamins from sticking to one another during manufacturing as well as to prevent them from sticking to machinery. However, recent studies show that magnesium stearate can also cause some serious side effects to the body if taken in large doses. 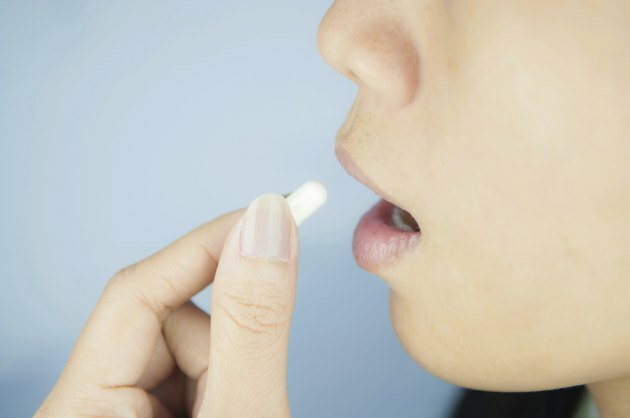 This innocuous additive is found in 95 percent of supplements on the market today. As of late, this additive is also being called a toxin. To better explain its dangers, you have to understand exactly what magnesium stearate does and where it is found in supplements. There is also confusion on the differences between magnesium stearate and stearic acid. Magnesium stearate is often found as a combined product of stearic acid and according to That's Fit, it is made by the hydrogenation of cottonseed or palm oil. Cottonseed oil has the highest content of pesticide residues of all commercial oils, and it coats the nutrients that are found in supplements. Therefore it also delays the absorption of these nutrients by the intestines. In large doses, magnesium stearate damages the skin and causes liver toxicity. Stearic acid, combined with magnesium forms the stearate; the acid is found in nature in many of the foods that are widely consumed such as poultry, fish, meat, eggs, butter, milk products, grains, cocoa, coconut and many others. The good thing about magnesium stearate is its lubricant property. According to Wellness Resources, complex formulas with multiple ingredients have inherently different chemical properties and, therefore, can easily stick together based on their properties. But this is where magnesium stearate comes into play. Once the raw materials of a vitamin product have been mixed together, it is very important to maintain the consistency, otherwise the nutrients going into the capsule will not be able to meet the label claims of potency or quantity. It also prevents ingredients from sticking to machinery while the ingredients are being capsulized. God or Bad: Why All the Debate? There are always two sides to every story. Something found in nature in most food products cannot be that harmful to the well being of its consumers. So why all the bad-mouthing of magnesium stearates? Much of the controversy over the additive arises from different companies, essentially competing with one another over the market share. Many companies that produce supplements take an all-natural standpoint, saying that they only use natural ingredients and nothing else. Other companies see additives such as magnesium stearate to be completely natural since it is derived from a naturally occurring fatty acid. Also, such companies advocate that the additive only saves them money on production as well as ensuring that their products deliver the nutrients and vitamins that they claim. What Are Maltodextrin & Dextrose & Are They Safe?